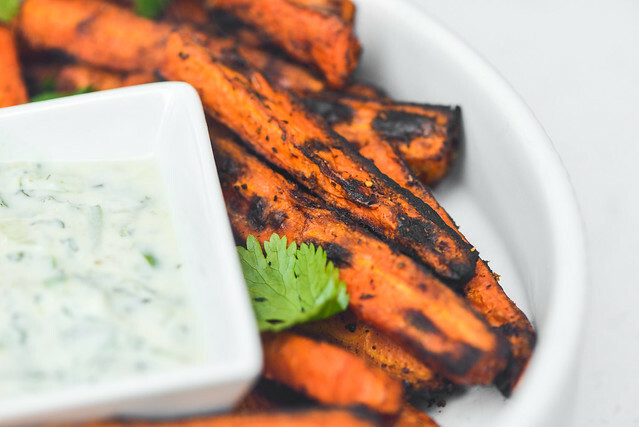 When you discover something simple and delicious, it can be hard not to over do it. I kind of feel I've gone in that direction with grilled cabbage, which I've featured with three different dressings so far. It's difficult not to be repetitive though when just a few modifications can output something both different and equally delicious. 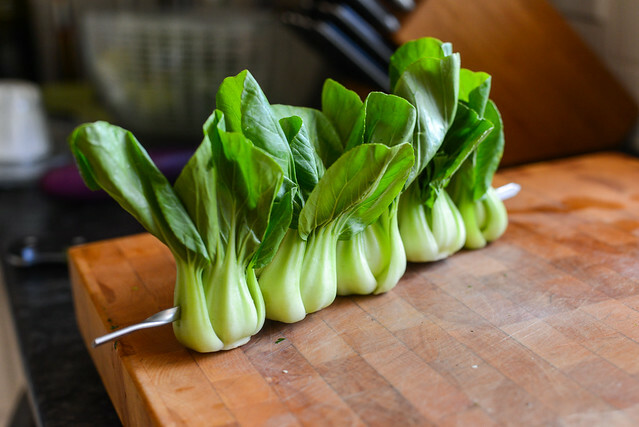 I feel I'm going to end up taking the same route with bok choy, which really isn't much different than my cabbage recipes—a leafy green grilled and finished with a dressing. I do think bok choy opens up a door for different flavor pairings though, and the ginger-garlic dressing I used on this one was totally worth documenting and sharing. 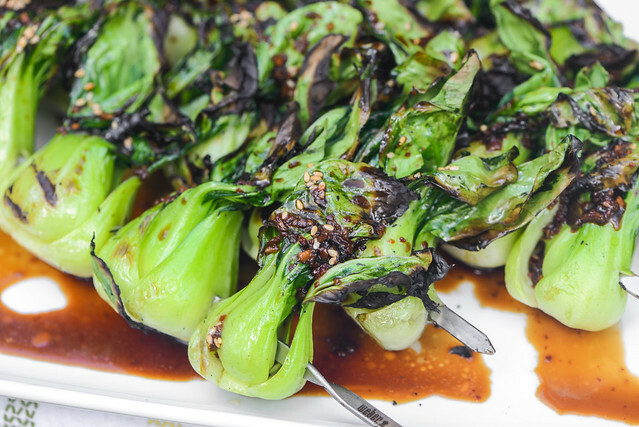 The last time I did a grilled bok choy recipe, I made a very simple honey-soy dressing. I wanted this new recipe to be more layered and complex than that though, so the dressing features a bit more ingredients, but still remains something you can likely put together with items already in the pantry. 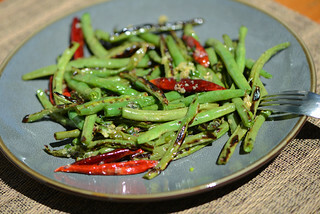 It was definitely of a Chinese influence, starting with a sweet and savory base formed by soy sauce, sherry, and brown sugar. 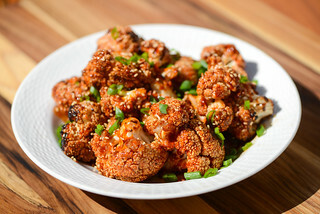 Then I added in the distinctive bites provided from ginger and garlic, added a double dose of sesame with both sesame oil and sesame seeds, and then finished it with a touch of heat provided by red pepper flakes. All the bok choy I had done previously utilized of the larger varieties, which I halved and then grilled. That was my plan again, but while at the store, I saw these bags of baby bok choy and thought they'd be a good change of pace and would require even less prep—just wash and dry! I then got the idea of skewering them, which not only scored some photogenic points, but also would make them easier to manage on the grill. I threaded the bok choy onto the longer, flat metal skewers I have, which I thought would keep them more sturdy than round bamboo skewers. If I had used the bamboo one though, I probably would have used two parallel skewers to increase stability and keep the bok choy from rotating. One big reason I keep coming back to cabbage and bok choy is for how quickly it cooks. It can't be overstated how good it is to have an arsenal of recipes than can be executed while a main dish has already been cooked and is resting. 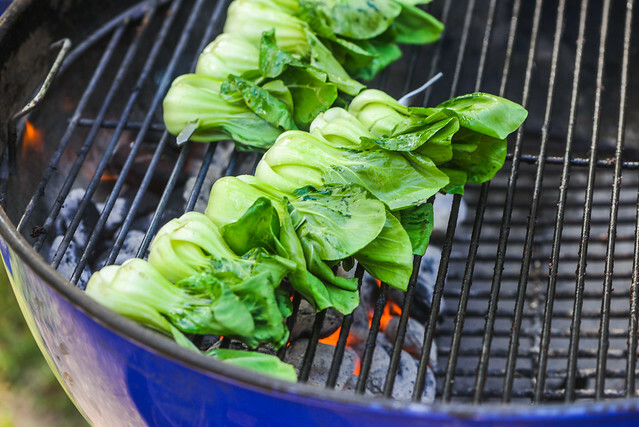 The grilling time for this bok choy is literally minutes, meaning you can easily get it done, with time to spare, if you have some steak, chicken, pork, etc, getting their ideal five to ten minutes rest before serving. 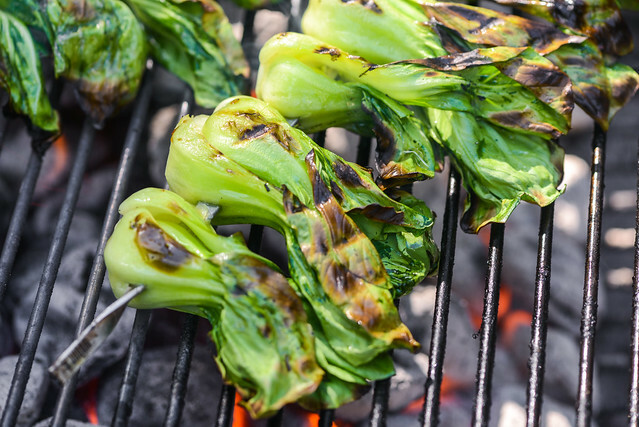 I grilled this bok choy on the first side until the leaves began to char around the edges, which over direct high heat, took just a couple of minutes. I was then able to easily able to flip all the bok choy quickly thanks to the skewers and let them finish up, which meant waiting for char to develop on the second side and the thicker stems to become crisp-tender—this only took another minute or two. 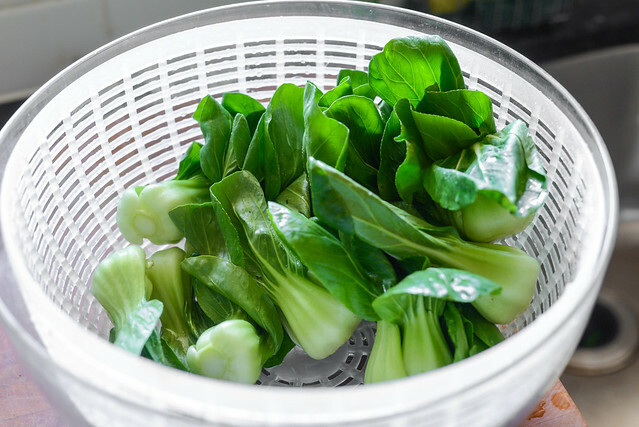 A quick to assemble, but complex ginger-garlic sauce gives this bok choy a flavor that tastes like a lot more goes into making it than actually does. 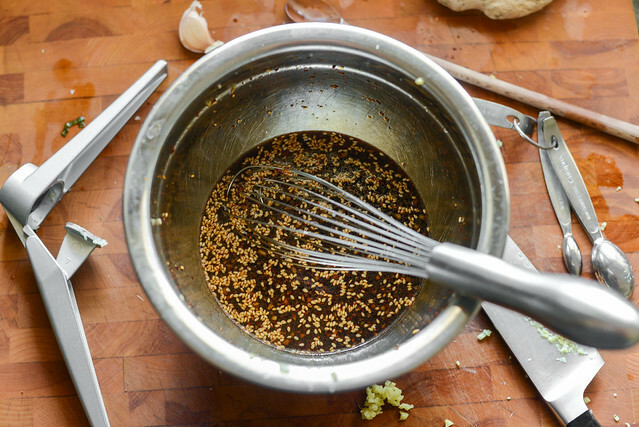 To make the dressing: In a small bowl, whisk together soy sauce, sherry, brown sugar, garlic, ginger, vinegar, sesame oil, sesame seeds, and red pepper flakes. Set aside. Light one chimney full of charcoal. When all the charcoal is lit and covered with gray ash, pour out and spread the coals evenly over entire surface of coal grate. Set cooking grate in place, cover grill and allow to preheat for 5 minutes. Clean and oil the grilling grate. 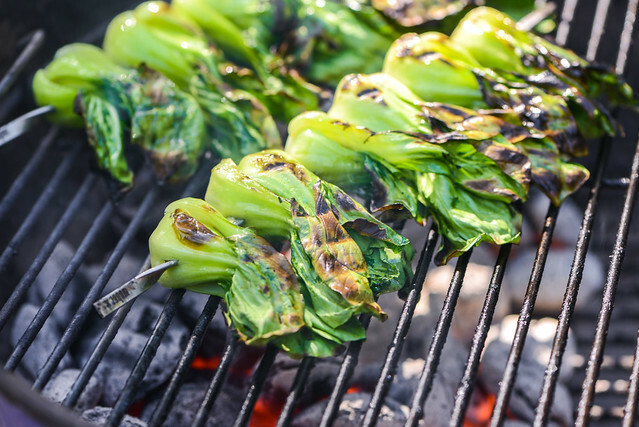 Place skewered bok choy on grill and cook until edges of leaves begin to char, about 2 minutes. Flip and continue to cook until second side develops light charring and thicker stem is crisp-tender, about 1 minute more.